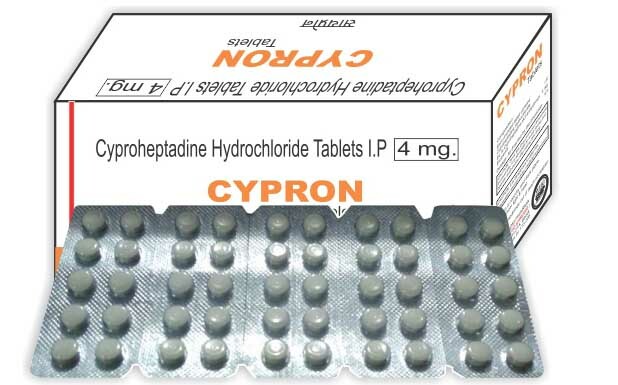 Cyproheptadine Hydrochloride 4 mg Tablets is a serotonin and histamine antagonist with anticholinergic and sedative properties. This is a first-generation antihistamine and has a wide range of anti allergic and antipruritic activity, and can be used successfully in the treatment of acute and chronic allergic and pruritic conditions, such as dermatitis, including neurodermatitis and neurodermatitis circumscripta; eczema; eczematoid dermatitis; dermatographism; mild, local allergic reactions to insect bites; hay fever and other seasonal rhinitis; perennial allergic and vasomotor rhinitis; allergic conjunctivitis due to inhalant allergens and foods; urticaria; angioneurotic oedema; drug and serum reactions; anogenital pruritus; pruritus of chicken pox. It is also indicated as adjunctive therapy to adrenaline and other standard measures for the relief of anaphylactic reactions after the acute manifestations have been controlled. After a single 4 mg oral dose of Cyproheptadine HCl in normal subjects, given as tablets, 2 to 20% of the radioactivity was excreted in the stools. Only about 34% of the stool radioactivity was unchanged drug, corresponding to less than 5.7% of the dose. At least 40% of the administered radioactivity was excreted in the urine. No detectable amounts of unchanged drug were present in the urine of patients on chronic 12 to 20 mg daily doses. The principle metabolite found in human urine has been identified as a quaternary ammonium glucuronide conjugate of cyproheptadine. Elimination is diminished in renal insufficiency. Use of Cyproheptadine HCl tablet is contraindicated in newborn or premature infants. Other contraindications include hypersensitivity to any ingredient of formulation, angle-closure glaucoma, stenosing peptic ulcer, symptomatic prostatic hypertrophy, bladder neck obstruction and pyloroduodenal obstruction. Cyproheptadine has an atropine-like action therefore, should be used with caution in patients with history of bronchial asthma, increased intraocular pressure, hyperthyroidism, cardiovascular disease and hypertension. Antihistamines may diminish mental alertness; conversely, particularly, in the young child, they may occasionally produce excitation. Patients should be warned about engaging in activities requiring mental alertness and motor coordination. Overdose of antihistamines, particularly in infants and children, may produce hallucinations, central nervous system depression, convulsions and death. Antihistamines are more likely to cause dizziness, sedation and hypotension in elderly. Because of the higher risk of antihistamines in newborns and prematures, antihistamine therapy is contraindicated in nursing mothers. Caution: Since this drug produces drowsiness occasionally, it is advisable to avoid and operate machineries after taking this drug. MAO inhibitors prolong and intensify the anticholinergic effects of antihistamines. This tablet may have additive effects with alcohol and other CNS depressants like, hypnotics, sedatives, tranquilizers and anti anxiety agents.